Today we finish our ten-month journey through the epic book of Acts, written by Luke, a doctor and traveling companion of the Apostle Paul. Prior to his ascension into heaven, Jesus told his followers, “You will receive power when the Holy Spirit has come upon you, and you will be my witnesses in Jerusalem and in all Judea and Samaria, and to the end of the earth.” (Acts 1:8) Luke uses that statement to give structure to his historical account as he traces the explosion of the Jesus-movement during the first 30 years following Jesus’ resurrection. 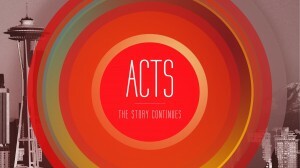 Today, in Acts 28, Luke brings his account to a climatic and sudden stop as Paul reaches Rome. The message for us is clear: the story continues. The big idea today – and of the entire Bible – is that we were built for a purpose, far bigger than living for ourselves. We were created to know the King of Kings and to live a life spreading the gospel of the kingdom. Let’s read chapter 28 together. Luke uses the “Kingdom of God” to summarizes Paul’s teaching. This subject was also Jesus’ favorite topic. Clearly, it must be important. Let’s take a moment to unpack this together. This subject is deeply profound and soul stirring. If there is any theme that connects the OT with the NT it is the Kingdom of God. When talking about the Kingdom of God, the Bible is not referring to a physical territory (e.g. United Kingdom), but rather the rule and reign of God in lives of his people. God’s purposes from Genesis to Revelation is to call out a people from all tribes and nations for his glory. God created all things perfect, underneath his kingly rule. Adam and Eve chose to disobey God and reject him as king – and in turn attempt to build their own kingdoms. The rest of the Bible, from Gen 4 to Rev 22 is the (true) story of God’s progressive plan of rescue of the King. The Old Testament makes countless promises, hints and prophesies that God will send a Messiah (“Anointed One”), King into world. He will make all wrongs right. He will establish his kingdom and rescue his people. This was the “Hope of Israel” (vs20). Jesus’ whole ministry was marked by the reality that kingdom of God has arrived. Everywhere Jesus went things got better. Lame. Sick. Blind. Deaf. Mute. Demons. Sin.WHY? The King has arrived. Repeatedly, Jesus would say that he came to …fulfill God’s promises, seek/save the lost, forgive sinners and give his life for his people. The King has come to put all wrongs right and rescue his people. The rest of the New Testament makes plain that Jesus, the King, lived, died, rose again to defeat satan, sin, evil and bring us into His kingdom. Ever since, this has been known as the gospel (ie. good news). In sum, the secret of belonging to the kingdom of God is belonging to the King. (Mt 7:23; 25:41) The church, viewed in this light, is an outpost of kingdom for those who belong to the King. The function of the church is to serve as a witness to King and the Kingdom by sharing the gospel of the king and living transformed lives that reflect the character of the kingdom. We’re the King’s people. Have you ever noticed that God chooses the most unlikely people for his purposes? In Acts alone: Fishermen. Tax Collectors. Slave girls. Eunuchs. Tent-makers. Rulers. Philosophers. Families. Pagans. Freaks. Even, the Apostle Paul. Prior to meeting Jesus he was just a religious + self-righteous + arrogant + Christian-killer. And, Jesus graciously saved him out of his dead religion. This is one reason Luke records his conversion 3x’s. Paul was the last guy you’d expect to follow Jesus. This should be deeply encouraging. God wants to use everyone in this room for his purposes. Q: Why does he use unlikely people? For his glory. To make clear it is God who is doing the work. He take unlikely people and makes them ambassadors of the King and the Kingdom in the lives of others. So, please don’t use it as an excuse, saying, “God would never use me.” That’s a pre-requisite for being useful to the King. APP: Who does Jesus want you to invest in? Work? Serve? Involved in lives of others? Steward finances? God not only works through unlikely people, he works through impossible situations. Think about Paul: Unjustly imprisoned. False trials. Ship wreck. Snake bite. House arrest. Couldn’t go anywhere. The great apostle to the Gentiles was held captive under house arrest and people had to come to him. Clearly that was not an ideal set of circumstances. But – and don’t miss this – God was using him for the advancement of his kingdom amidst impossible situations. Jesus promised, “I will build my church and the gates of hell shall not prevail against it.” Mt16:18 This is a promise. This means that your impossible situations are not mysteries to God: singleness, unemployment, sin struggles, etc. God is bigger than our circumstances. Common command: “Do not be afraid…For I am with you.” Too often we’re faithless and timid and choose comfort and ease? When we live that way we end up with a bland, lifeless Christianity. We serve the King of Kings! Jesus did not live, die and rise again to make our lives bland and lifeless. Listen to this call to courage, bravery and risk by T. Roosevelt. As far as we know he wasn’t a follower of Jesus. If he could say this, how much more we? Where is our trust, faith, courageous risk for the cause of the King? He works through impossible situations. The credit belongs to the man and woman who is actually in the arena. Yes, be wise and be good stewards of time, resources and opportunities. But it is possible to hide behind those things when it’s really just unbelief. Do people see you as someone who is following a good King, even in impossible situations? “some were convinced by what he said, but others disbelieved.” vs24 I chose the world “unbelievable” intentionally as it has a double meaning: to some the gospel is just not believable; to others it is too good to be true. Jesus came to save us out of our empty religion and our empty irreligion. Empty religion: Trying to clean yourself up, be better, try harder, more moral. This misses the entire point of the Bible and Jesus. You can have a superb Christian t-shirt selection + Jesus bumper stickers + be the 3rd grade Bible memory champ…and still be far from God.Empty Christianity is a system based on external action NOT internal love. You’re never going to clean yourself up. We need a savior. Jesus, the King, Saves us out of empty religion and empty irreligion! He moves us from death to life, darkness to light, unforgiven to forgiven. But there is also a warning here. Some refuse to believe. Maybe some of you. Don’t harden your heat. God may let you. Notice Paul talked about the Kingdom and the gospel from “morning till evening”. We’re told he: expounded, testified, convinced, proclaimed, taught. Why did Paul keep talking about this? If you believe Jesus is risen, ascended you have no choice. What else are you going to talk about?Jesus is not a distant divine being that you’ll magically float to some day. We’re not talking about a philosopher, lecturer, an idea or a scientific equation. We’re talking about a person, the King of Kings.He is the world’s true King and the Lord of Lords. If you believe that, you’ll want to talk about him. We can’t get over this! If we ever do, we’re done. This is about him. Look at how the book ends. Why does it end so abruptly? Anti-climatic. Intentional. The story continues and we’re a part of it. The kingdom is still advancing through unlikely people, impossible situations, and unbelievable gospel. This is not about us, our preferences, our pet ministries, our music selections, our comforts. Jesus didn’t die on the cross to save our careers. He didn’t rise again to raise our standard of living. Jesus doesn’t just make better people – he makes NEW people. This is about the King. Ex. Les Miserable. 1200 pgs. ValJean. Convict. Grace. Life redeemed. Decades. Selfless. Misunderstood. Wrongfully pursued. Incredible life. Towering character. How does he die? Monument? Parade? Newspaper article? Name library after him? Incredible life. High’s and lows. Courage, risk, faith, selflessness. Dies unknown. But it was a life well lived. Here’s my plan: As far as I know I will die in this city, proclaiming the king, unknown. Q: What are you living for? Giving life to? If we’ll be unknown, what do you want to be known for now? Money is great. Success is great. Relationships are great. Popularity is great. Hobbies are great. Being chosen and known by the King is infinitely greater. Unknown to the world, but known by him. DCC, the story continues. We’re a part of it. Let’s give our days and dollars for the King and His Kingdom. We’re in Seattle for the King. Let’s spend and be spent for the good of this city and the glory of God. I have three or four decades of life left. I want to give them all for the King. What about you? What could the King do in this city if we all gave our lives to him? Do you belong to the King? Does your life reflect you follow a good, gracious and great King? Putting limits on what God can do with you? Are you in community? Fighting sin? Giving sacrificially? In what ways do you need to lay down your own kingdom and start living for His kingdom? God’s Kingdom advances thru unlikely people, impossible situations and an unbelievable gospel. The story continues – and we get to help write it.